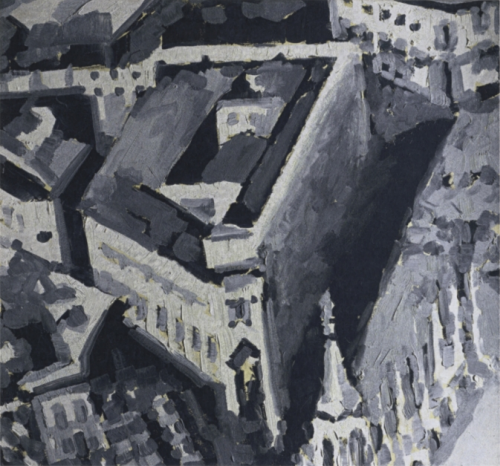 Back to the use of maps as a framework for artistic expression with Richter’s Townscapes. Here, artist Richter has created a range of paintings that are based on oblique views of different towns and cities. He approaches each work from a different perspective and experiments with scale that mimics the approach a cartographer takes in determining how much to generalize a feature. For some paintings, the scale is smaller and the view is from a higher elevation and so the buildings take on a rather abstract form, perhaps just the general shape and the inclusion of major features. Examples that are at a larger scale inevitably include more of the building’s detail. That said, the large scale paintings are perhaps less easy to recognise due to the larger size of shapes. 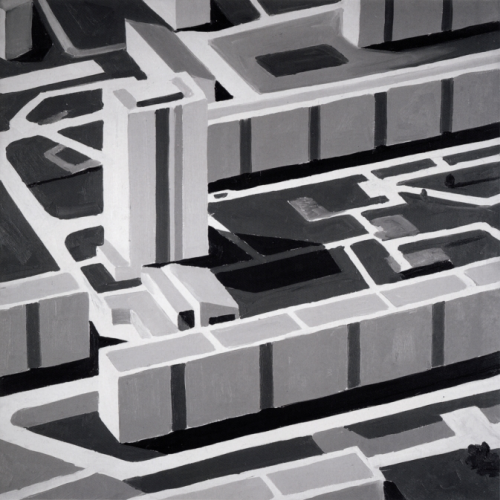 Because the paintings are all in shades of grey we tend to see large indistinct blocks of grey which are not necessarily immediately seen as buildings. Of course, standing back from the paintings gives us a different perspective, the image occupies a smaller form and we tend to see the images more clearly. 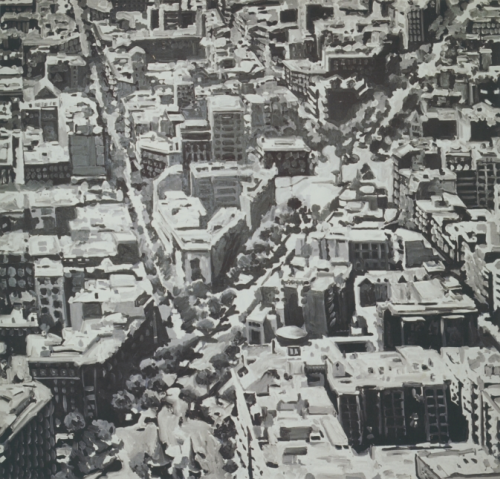 At distance they begin to look like monochrome oblique aerial photographs. Richter also experiments with different brushstrokes and textures, going from very fluid approaches to strongly geometric. As a collection, they give us a fascinating way to reflect on the urban form and, perhaps, show us a little of the artistry in how we approach the task of generalization as part of cartographic design. Scale, form, texture and viewing distance all strongly modify the viewing experience. These are key processes in understanding cartographic design. You can view more of Richter’s Townscapes at his web site here. The shape and form of the various geographies around us make for interesting canvases for a wide range of artistic interpretation. Rendering the familiar in challenging alternative colour palettes can bring a new aesthetic to the landscape and perhaps challenge our notions of what works in a cartographic sense in representing geography. Artist Jazzberry Blue tends towards the creation of abstract works that centre on geometrical shapes and patterns. 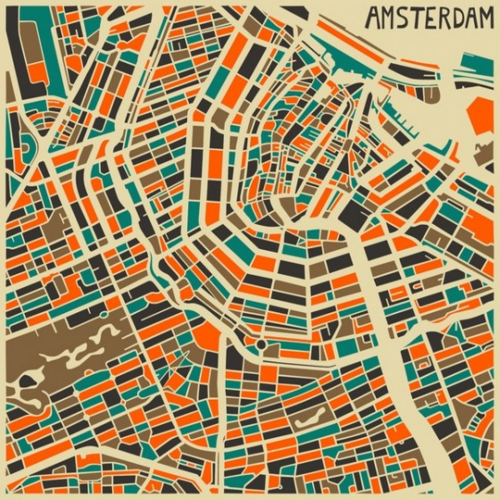 Maps have also provided a focus for many pieces of work as colour is used in an imaginative way to re-style the cities. Here, the shape of Amsterdam is clear with roads and canals cutting through a patchwork of bold colour whose palette is in perfect balance. While a traditional map prtrays the structure of a city it’s conventional use as a product to aid navigation, wayfinding or other spatial requirement dictates its style supports those functions. Artwork doesn’t have the same requirement and with the shackles thrown off, it gives us a wholly different way to view space and place. These are no doubt maps but they are maps as an art form rather than for conventional purposes. You’d not be able to use them for wandering round a city…but they will likely look terrific hanging from a wall. You can see many more examples of maps by Jazzberry Blue at the Jazzberry Blue web site here. Using maps as a way of expression is common and fertile ground for artists and a wide range of social commentators. Here, Philip Drucks uses the shape of his own head to provide a narrative and a metaphor for his own existence. The image simply uses the three-dimensional head with symbology used to represent different distances from the viewing plane. It’s effectively a hypsometrically tinted relief map though, of course, a large slice of artistic license has been applied with the colour in particular. The area around Right Drucks shows the side elevations that mimic a fairly standard tint pallete but the front of the face takes on a startling range of red hues. It’s not the sort of elevation tinting you’d ordinarily find on a map but then this isn’t an ordinary map. Place names locate family and friends around the map and clever use of other map symbology helps explain the line of the closed mouth (a river) and the empty holes for the eyes. 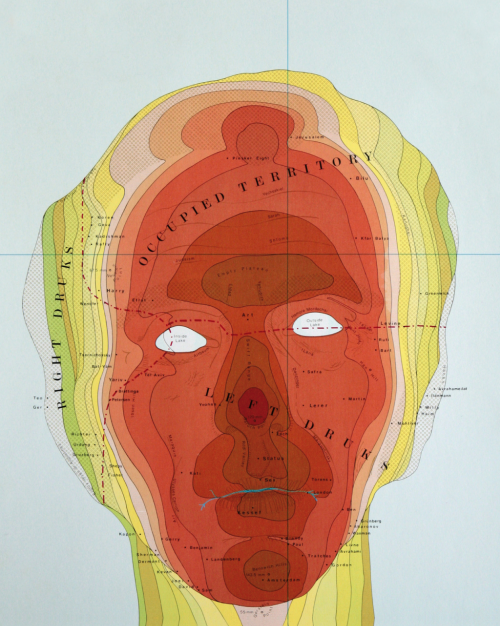 Drucks is not the only one to have mapped the human face or form in this way but it provides a strong image and a powerful way of mapping map symbology onto alternative forms to give them some sense of spatiality. Taking world shapes, maps, outlines or other map-related content gives artists a palette to work from that immediately creates recognition in the audience. People are instantly able to recognise the shapes of countries so the barrier to seeing and becoming interested in a piece of abstract art is perhaps lessened. Brigitte Williams has created numerous works that follow this principle and in so doing she organises her work in some sense of structure to provide a commentary on the relationship between the patterns she makes and out understanding of the world. 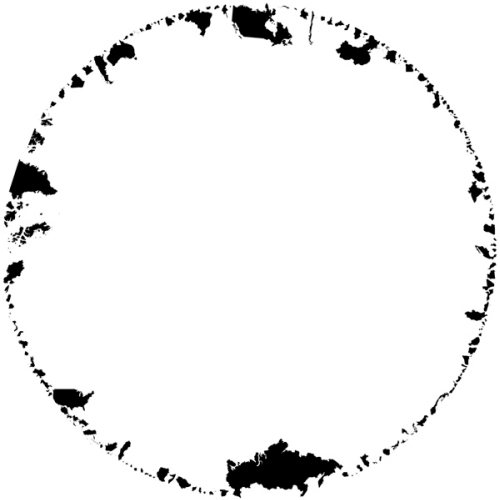 In Peace is a stark, circular image that is predominantly white space yet has the shapes of countries form a circle. A circle of peace perhaps? The white emptiness in the middle perhaps also suggestive of a lack of communication or maybe some other visual metaphor? It’s a strong aesthetic. A second piece, called Dislocation, shatters the perfect circle and positions the countries in an apparent random order. They are actually placed quite deliberately and seem to have perfect borders and an amount of white space dissecting them. 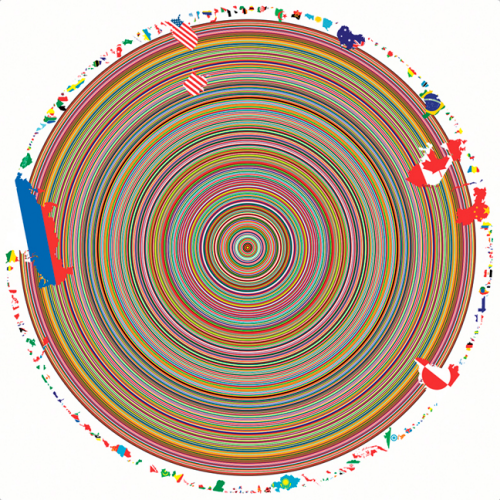 Finally, she also uses colour and splashes the countries shapes with flags which seep into a series of concentric rings to create an almost hypnotic pattern. This work is called United. Williams is simply borrowing shapes from the world of mapping and repurposing them but creating new works that make us reflect on the structure of our world and place within is no bad thing. Sometimes the very familiar shape and structure of our world on a standard globe becomes rather unremarkable and it’s important to stand back and reflect on different perspectives once in a while. You can see more of Willaims’ work here. It’s probably possible to make a map of just about anything and that includes the human form. The natural undulations and features of the body provide a rich terrain for people to let their cartographic juices loose on. Philip Gonzalvez did just that in this map of his face. 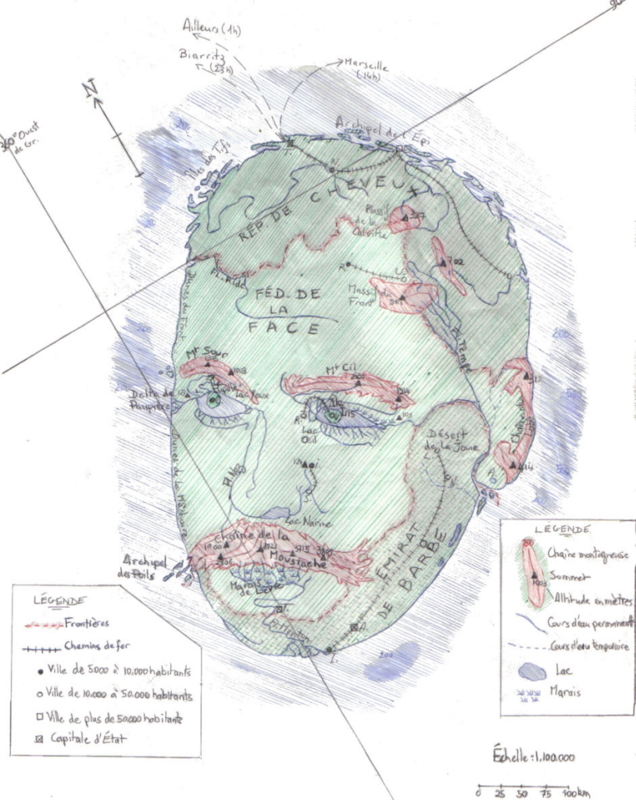 In what has been referred to as ego-cartography, this map describes his facial features using map symbol metaphors. The face is an island, strangely detached from its body but the usual green for land and blue for surrounding water provides the clear story that we’re looking at a man as an island. Prominent features are symbolised in a different colour to connotate elevation and a change in terrain with many other standard cartographic representations used to show discrete facial features such as the hairline as a border, eyes and nostrils as lakes and there’s even spot heights shown (and bathymetric depth noted). The République de Cheveux (Hair Republic) sits on the border of part of the Fleuve Ride (Wrinkle River), with the Fédération de la Face (Federation of the Face) beyond. There’s ports and ferry routes as well as all the usual map marginalia such as a graticule, north arrow, legend, border and scale, as both a representative fraction and scale bar. The map even offers a cartographic joke as the meridian line dissecting the island is at 360 degrees west of GR. (Greenwich) which given that longitude is split into 360 degrees would place the map exactly back at Greenwich. It’s whimsical and hand drawn. There’s nothing particularly exact but as an artistic representation, in map form, it clearly illustrates that map’s can be made of anything. 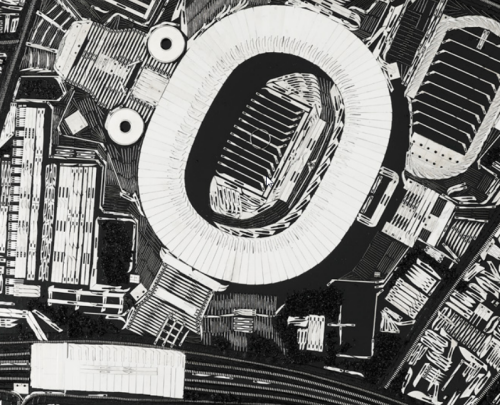 As ubiquitous and recognisable objects, drawing another object in the style of a map doesn’t present a major challenge to the viewer…though perhaps intrigue and a fascination for how the artist has encoded their unique geography does. This MapCarte series has attempted to draw attention to classic cartographic design that we recognise in great maps. Occasionally it has also highlighted the work of artists who either approach cartography in an innovative way or use maps as part of their artistic works. This example falls squarely in the latter category as renowned British artist Damien Hirst moves away from the infamous Tiger Shark in formaldehyde as part of his ‘The Physical Impossibility of Death in the Mind of Someone Living’ series to explore the structure of maps. 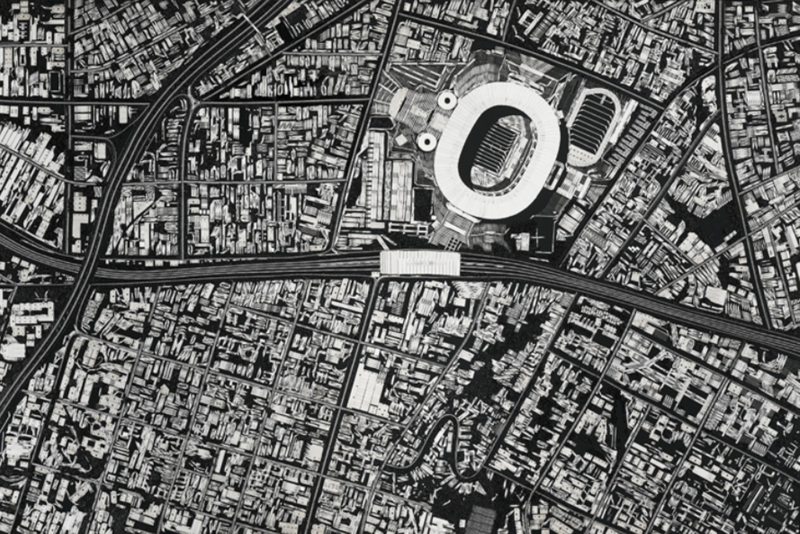 The subject of death is, though, never far away from Hirst’s work as these spectacular urban maps are constructed entirely out of medical instruments. 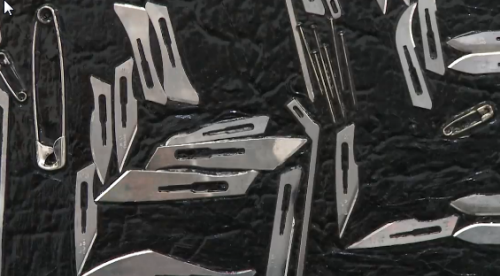 Britain’s richest living artist, compared by Tracey Emin to Andy Warhol in terms of his importance to art, has displayed this series called ‘Black Scalpel Cityscapes’ in São Paolo, Brazil, which features surgical instruments arranged as bird’s-eye map views of 17 cities, including Moscow, New York, Beijing, and Vatican City. The works use scalpels, razor blades, skin graft blades, safety pins, stiching needles, wire cutting spools, hooks and gloss black paint to represent buildings, roads and other features of the urban landscape to create faithful vies of the cities. 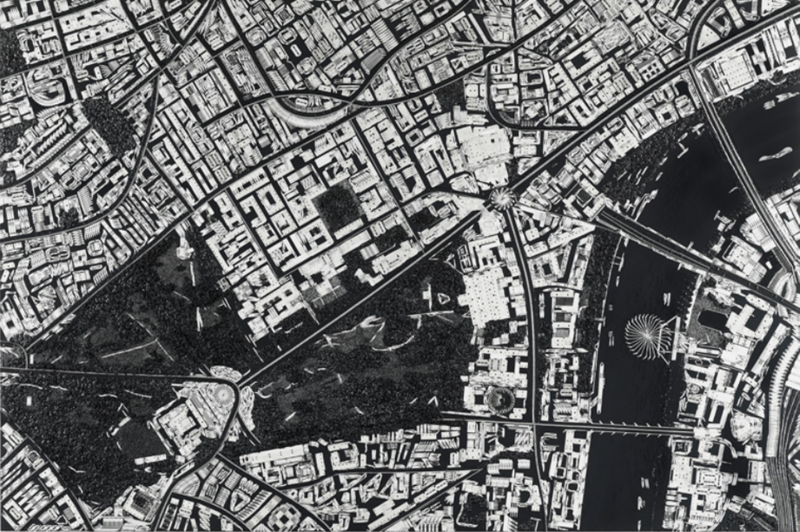 Hirst uses his art to comment on themes of surveillance and modern imagery based maps such as Google Earth. His use of surgical tools is a metaphor for the dissection of societal wide anxieties over surveillance and the digitization of warfare, as well as Orwellian distopias and the way surveillance imposes on individuality. Hirst suggests these works show portraits of living cities but all of them have echoes of conflict either as sites of recent terrorist activity, epicentres of religious or socio-cultural importance or major world cities. Even Leeds, UK (his birthplace) is represented. Milton Keynes, UK was the inspiration because of the regularity and systematic structure. While some may wittily suggest this is at the cutting edge of art, it’s certainly taking cartography to a new place. Our usual modes of design and production are challenged by Hirst yet the images he produces are familiar, accurate and aesthetically pleasing. 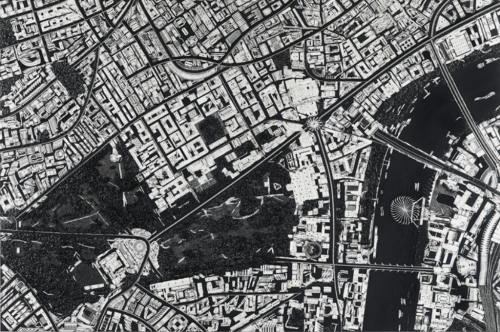 He hasn’t created some modernist haze, but the use of sterile instruments to create sterile scenes in black and white that we recognise immediately as a satellite view or an aerial photograph is impressive. The works are beautiful and engaging. They mimic our more usual ways of seeing cities from above. The materials challenge our thinking and challenges our cartographies. Many of the works are planimetric but Hirst even tackles 3D in the Hong Kong example. While there is no colour at all in the images, the metal of the surgical instruments catches the light as you view the works to create different views of the world. Hirst also recognises that the works have to be a certain size for the instruments to work since at smaller scales the size and shape of the instruments wouldn’t create the curves and lines required. These works are not just random cartographic experiments. Hirst has studied cartography, scale and representation to bring his art to life. More of these works can be seen at Design Boom’s web site here and Hirst discusses the work himself in a short film on the White Cube gallery web site here. Now then…how much for one of these pieces Mt Hirst? When mapping a specific theme it’s often useful to create the map to reflect that theme; to make the map speak to the mapped phenomena and attract the map viewer with an object that does justice to the content. There’s little point creating a map of Palm Springs Mid-Century Modern architectural heritage in some nonsensical gothic style. It just wouldn’t work and your map loses credibility. Here, Nat Reed has captured the spirit of the 20th century Desert Modernism that found its home in Palm Springs. The use of glass, clean lines, the combination of natural and manmade resources and the focus on indoor/outdoor spaces is what characterised this particular design aesthetic with the backdrop of the stunning desert landscape. The affluent clientele were a perfect audience for these visionary architects to let their creative juices run wild and they created notable buildings of almost every type. Today, Palm Springs remains vibrant but lives off much of its historical vibe, including the architecture. Nat Reed’s map evokes that spirit and reflects the design ideals inherent in the architecture. 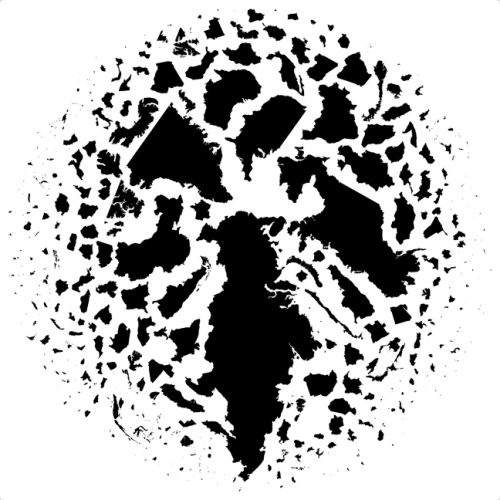 The map is heavily stylized in shape. Scale is abandoned and symbology is clean and angular (see the sun, cacti and big horn sheep for instance). The map captures the retro feel perfectly. 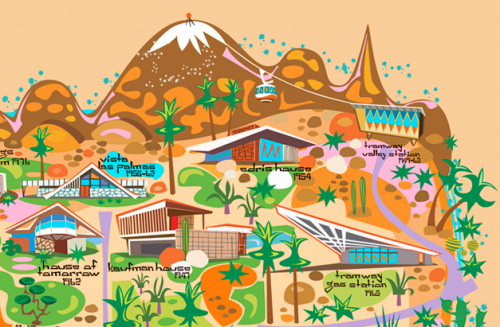 Colours are bright and vibrant; the illustrations of the buildings cartoon-like yet also showing some of the essential character of each building. 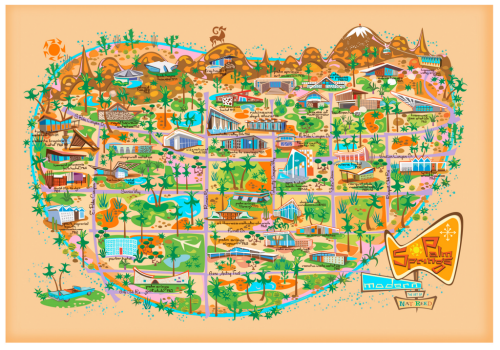 This is a fantasy map luring you to the fantasy land of Palm Springs and with at least an inspiration from early Disneyland maps. The grid structure of the streets holds the work together amongst the palm trees and other green foliage. There’s even an outer river or moat that seems to envelope Palm Springs making it appear even more like a fantastical island. With north to the right, the San Jacinto mountains are shown in aspect at the top of the map with the city laid out before them. The typographic elements are also in keeping with the overall theme. 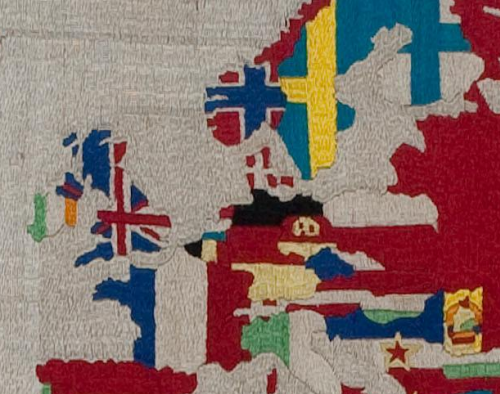 Here is a modernist map that creates a perfect cartographic link to the theme being mapped. 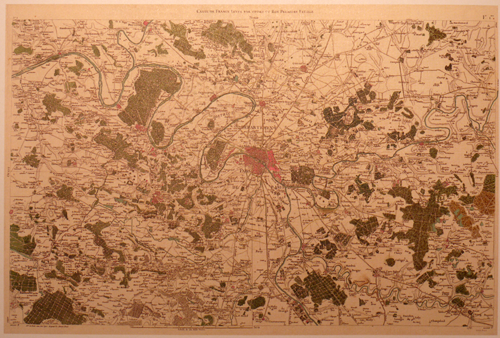 More details of Reed’s map and other prints on his web site here. 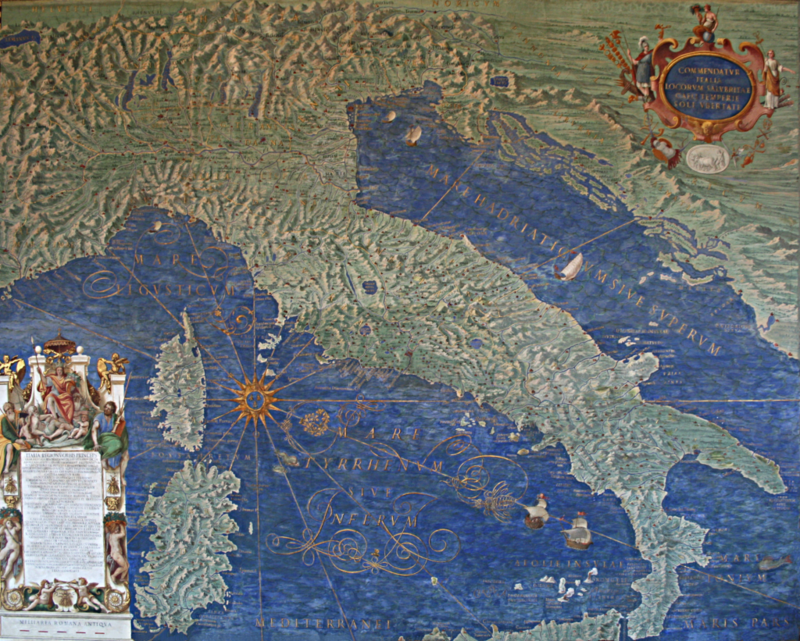 What could be more carto-artistic than 40 painted map frescoes in a 120m gallery? 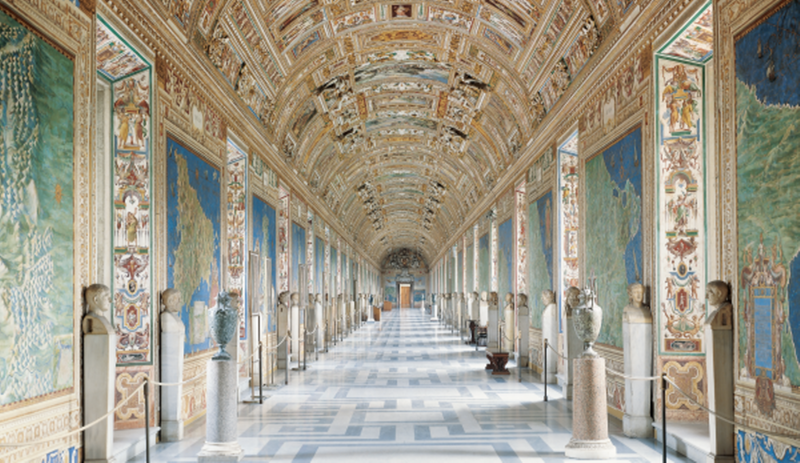 The Vatican is home to The Gallery of Maps, a stunning set of large-scale paintings that showcase Italy through wonderfully rich and vibrant topographic maps. They were drawn by geographer Ignazio Danti as part of a Commission by Pope Gregory XIII in 1580. Others painted (literally by numbers) to fill in the detail. 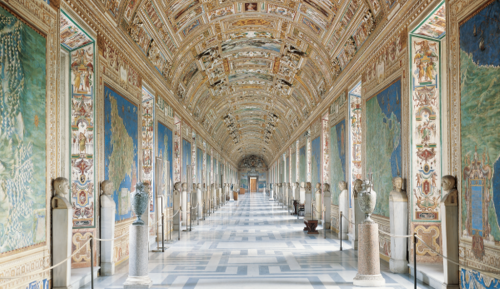 It was simply designed as a way of decorating The Vatican. The 40 works took three years to complete and cover the whole of Italy as well as a range of panoramic views of major cities. 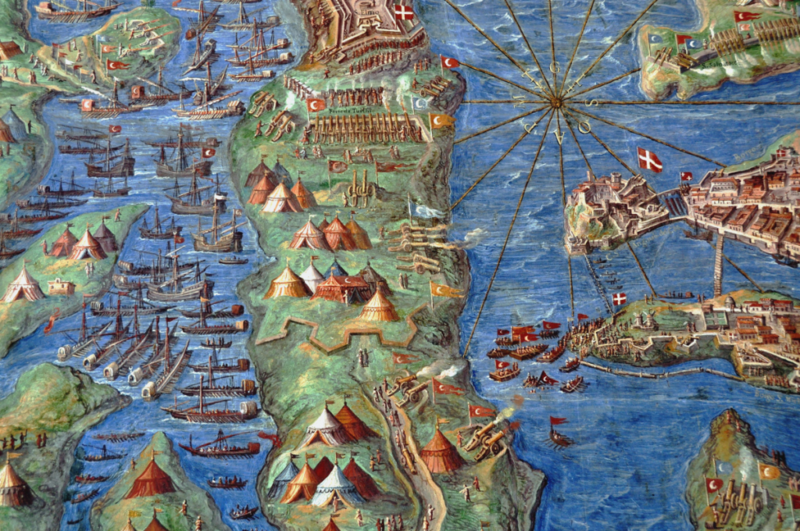 The timing was ripe for maps to be considered an important element in scientific discovery as well as for decoration. The age of discovery had revealed new knowledge and scientific instrumentation such as the sextant, magnetic compass and telescope had improved accuracy of measurement. Mercator and Ortelius were making landmark world maps at around the same time. Pope Gregory XIII wanted The Vatican to join the cartographic revolution through this ambitious project. The maps are beautifully drawn and detailed. The large-scale paintings have a consistency that ensures they are seen as a set. The rich greens and blues for land and water create a beautiful palette that gives the hall a richness of colour. Terrain is well presented with detailed shading and the maps are full of ornate flourishes such as waves in the sea, cities, tents, boats and sea creatures. While many of these elements are totally out of scale compared to the backdrop map, they show a range of important scenes and the design supports the scale, size and purpose of the project as a gallery through which you walk en route to the Sistine Chapel. Mapping entire countries is not for the feint-hearted. In 1744, Cassini prepared the first systematic, nationwide survey of a nation state, France. He was later commissioned to produce a more detailed map series to ultimately consist of 180 separate map sheets. This was not the work of a year or even a decade of preparation. This feat was the culmination of a century’s work by three generations of the Cassini family. Monumental in design and scope, Cassini’s map series was the result of scientific survey based on the triangulation of France which began in 1669 by his ancestors. 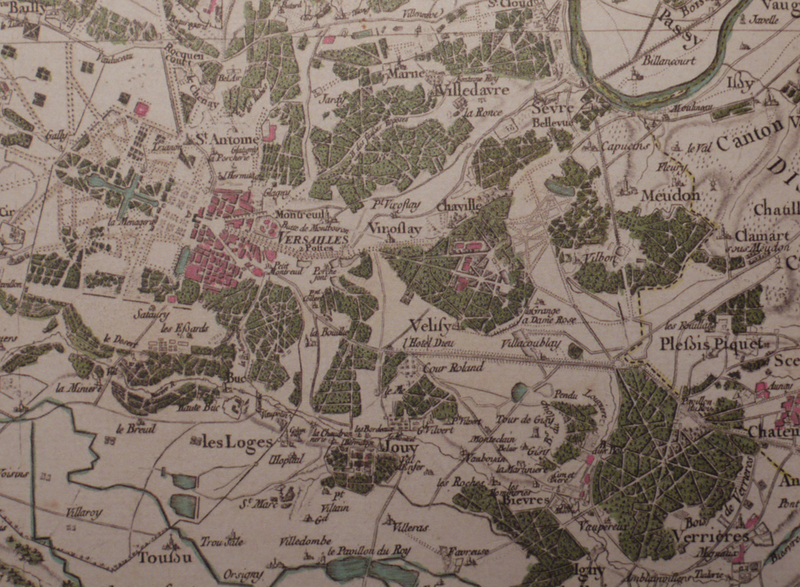 By 1678 the Paris region had been mapped at a scale of 1:86,400. Various wars and other campaigns meant that surveying the remainder of France didn’t truly get going until 1733 when Cassini (strictly, Cassini III) recommenced the survey. Cassini’s map of 1744 laid out the traingulation of France but it required further surveys to fill in the map with topographic detail. The new topographic map series, also at a scale of 1:86,400 began in 1748. It encompassed an 18-year plan with 10 maps to be published per year. The first two maps in the series took 8 years to be prepared yet they became the first properly surveyed, planimetrically accurate maps of a country. The level of detail was astonishing for the time and out-shone previous cartographic efforts by other European map-making dynasties. These maps immediately elevated France to the pinnacle of European cartographic excellence. The map of Paris shown here was part of the second survey series. The detail and artistry is incomparable for the time. The use of colour highlights different land use types with a bright pink being used to show built up areas intersected by a generalized but highly detailed street network. Shadows are used throughout to emphasise different elements which raises them to create a pseudo-natural look and feel. This is particularly evident on the deep green forested areas which also contain a pattern fill. Topography is shown with shading and fine hachure abd shadows are also used to add depth to rivers, shown in blue. The typography is beautifully applied and pictorial symbols finish off the detail showing the positions of churches and other landmarks. This is a key map in the history of cartographic design. Accurate and beautiful. Form and function. Many artists work with maps. 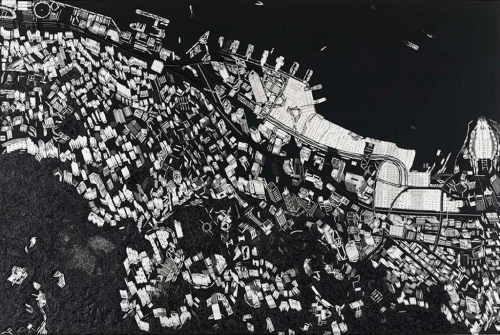 Indeed, we’ve focused on two exponents of the art world who have very successfully worked with map imagery as part of their work in Jasper Johns (MapCarte 3/365) and Andy Warhol (MapCarte 294/365). Here, we focus on Alighiero Boetti who famously used the map for a series of works in the late 1900s. He became fascinated with the outlines of maps as human constructs – borders that demarcated often contested places. At the same time he also became interested in embroidery and he worked with Afghan craftswomen who created a series of world maps. He didn’t specify any constraints and the maps he created from the woven fabrics are a function of the way in which the craftswomen interpreted the world. This applies specifically to colours across the maps which changed between different versions based on the choices of the women themselves. 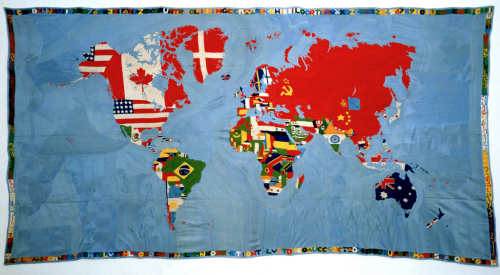 Boetti began to use the maps not only for their colourfulness but also as a lens on western cartography and the reality of the world view of the Afghan women. In some respects the craftswomen were also learning some of the craft of cartography. The maps also reveal a sense of global changes in political structure as the shapes of countries and the flags change over time. They become a collection of geopolitical reference points despite their otherwise unscientific appearance and construction. 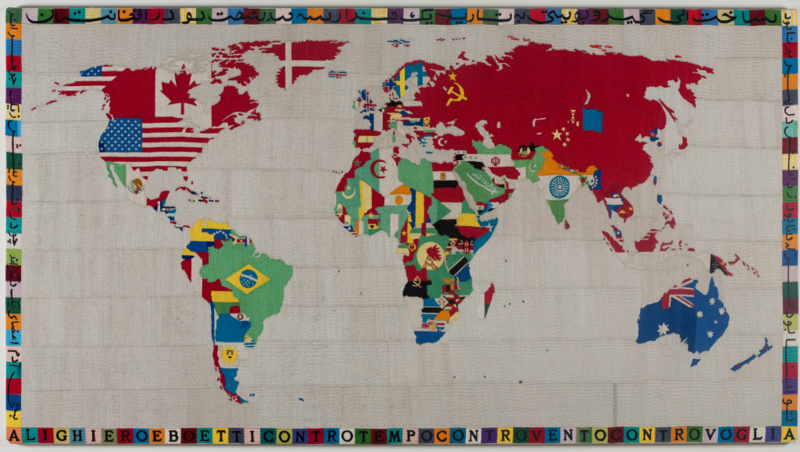 Boetti also experimented with different map projections that could be used to emphasis the politics of the time with different sizes and shapes of land masses and countries shaping the way the map was designed. Boetti’s woven maps have become icons of the modern art movement which make statements about cartography, projections and the shape of the political world. Indeed, the very fabric of how the world is constituted and how it changes is woven into the different Mappas over time. There’s no typographical components and no pen and ink. These are real, tangible, human maps made by humans. The meaning imbued in them is a function of the deep impressions made on the Afghan craftswomen.